I strongly suspect the ongoing DSification will fix any clickability issues you're seeing, as the map will be built a bit differently, but it's still worth being able to check and see if the updated webclient has the same issue. How can the webclient functionality be enabled in the GNU/Linux CLI version of DreamDaemon? It's not referenced at all in the --help or manpages. Not at the moment, but I would like to eventually provide a CEF-based exe that could be used for this purpose. Unlike the old byondexe, it would probably be completely detached from BYOND (not using keys). Is this still planned? In other words, will there be a way to play a game using the webclient in standalone form (lack of better wording here)? It's not on my immediate horizon but I'd like to look into it at some unspecified point in the future. Thanks for the tip, it's a rather straight forward flag but it should be documented in the manpages eventually. I'm also wondering why text comes back wrapped in span tags, regardless of how it was sent initially. I find it hard to use the string that way and am wondering if it's intentional. Span tags should not be present if there was no styling to the text. If they are, that's a bug on the server end. In my project the maptext_x and maptext_y offsets do not have an affect on the way the text is displayed in the web client. In Dreamseeker I have it set to draw text one tile to the right of the atom it is attached to, but in the web client it starts at the bottom left hand corner of the atom it is attached to. If you guys aren't aware of this issue yet or think it is a special case I'll be happy to set up a test project. The maptext_x/y vars are used on the webclient and I've tested them there before, so I'm not sure why you'd be seeing an issue. A demo and a bug report would be most helpful. And I was pretty confused about all those functions and how I should use them if it was necessary to use them in my case and how I would use them in the practice of the game code, if someone in this topic or another Independent can do a guide to create a "simple interface" explaining in practice the use of all those functions or some of the most important would be something very good to have at hand, thanks already to anyone who is inclined to help in any way . One. However, the .dms files for the individual controls are available to study by anyone. Any user is free to play with those files, using the info in the webclient documentation, and make suggestions as to possible changes. I would also fully encourage users to produce brand new controls. when a player open an addicional window in my game its location always go to screen center, its not a problem but some times the window hide some other GUI and he cant move it there is a very fit line to try move the window out of the hidden gui, can anyone help-me with it? Why flash and not Html5? And why I have to enable flash to play? And why is it so slow compared to dream seeker? Why does not it work well on mobile phones? Why the advertisements that do not appear are there to disrupt the player's experience? Why download so slow compared to DreamSeeker? Why does the download often stop without explanation? Why is the cpu usage 5x larger? And why I have to enable flash to play? You shouldn't have to, although there might be a legacy message there related to the ads that could be changed. And why is it so slow compared to dream seeker? It's not supposed to be; whether it's slow will depend mostly on the device and browser running it. For typical games on a modern computer it generally has good performance. Why does not it work well on mobile phones? Depends a lot on the phone. I'd need more information. It could be simply because a lot of them have a fairly limited processor compared to desktop devices. Why the advertisements that do not appear are there to disrupt the player's experience? Ads are to support the platform. I wish we didn't need them. Why download so slow compared to DreamSeeker? I haven't noticed a poor download speed. Why does the download often stop without explanation? No idea. I've only seen that a handful of times and each time it appeared to be a browser issue. That's not to say there isn't a potential bug involved, though. If you know of a way to get it to happen more reliably, I'll be happy to look into it. Why is the cpu usage 5x larger? I'm working on the next webclient version for 512, and it contains some enhancements that I believe will have a positive impact on performance. With each new version I'm always looking to find ways to make the most out of the environment it's running in. 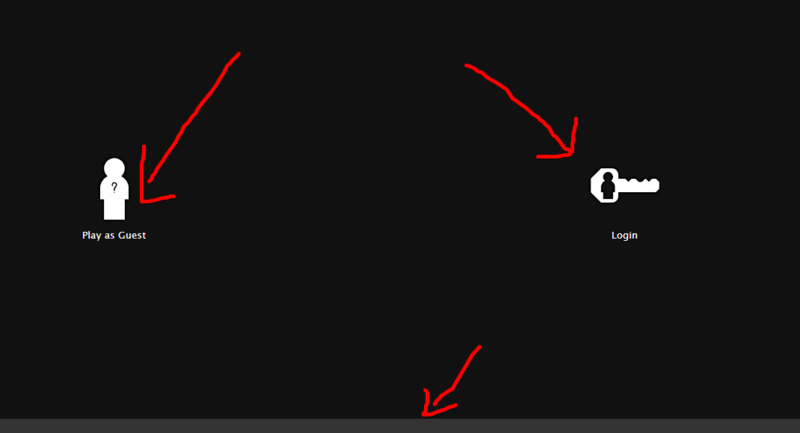 How to remove this unwanted things? I want to put my login screen in the part of the game.